The whole crowd ... Trent probably hit this one! We came to honor Duke, a young shorthair we’d hunted with years ago in Montana. Duke impressed me with his metamorphosis over one day’s hunt: from new kid in the kennel, insecure and unsure of whom to work, for to a confident young dog. Duke’s distant cousins hunted with us today, Gabby and Cricket coursing the deep grass and heavy cover that makes Pheasant Bonanza such an awesome hunting destination. Thanks to Frosty our guide, and Trent Leichleitner the manager at this beautiful spot. Yes, Nebraska is scenic, rolling hills and hardwood bottoms full of fall colors. The shooting, thanks to Trent was spot-on. He was kind enough to give me partial credit on pheasants that obviously fell to his shot string. Beyond that, highlights included Buddy’s points and a couple pretty good retrieves, and Manny, after two days of skunking finally found a ringneck and made a solid point. 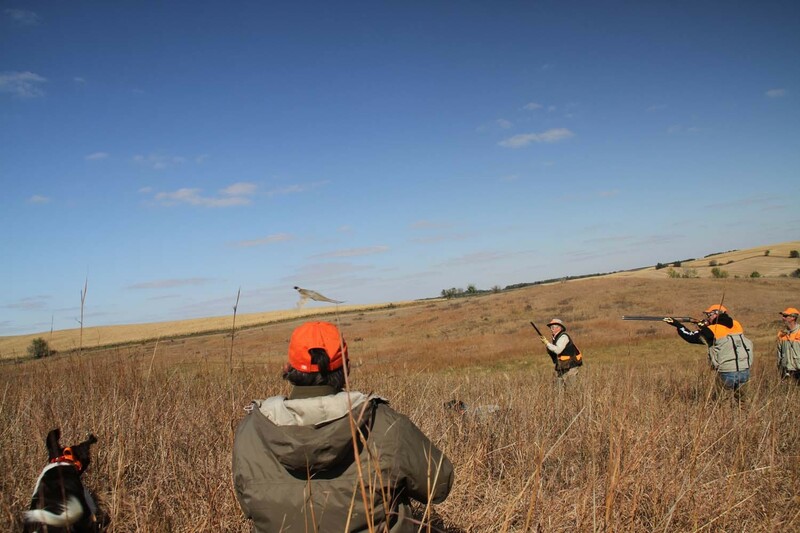 A track and a flush, and … yours truly got a few pellets into a bird that flew into standing corn. Risky, but I sent him for the retrieve and got it. Ditto for another nice point, which Trent and I both dropped inside 20 yards … and another nice retrieve. I didn’t want to, but when Manny appropriated the head, I didn’t argue. Would you?